One exciting aspect of the new MacBook Air release is the prospect of greater Wi-Fi speed and performance. That’s because Apple’s updated laptop sports built-in compatibility with the newest draft networking standard, 802.11ac, an upgrade of the current 802.11n. That draft standard (established by the Institute of Electrical and Electronics Engineers) is also built into Apple’s newly released AirPort Extreme Base Station and AirPort Time Capsule hard drive. 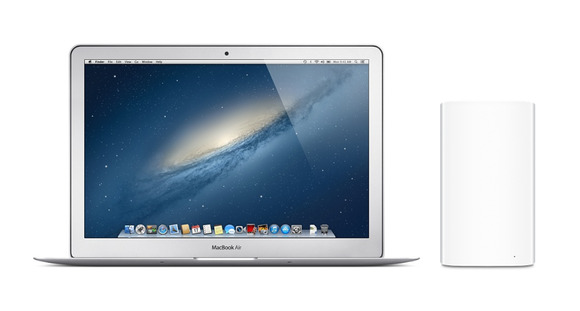 The new MacBook Airs are among a handful of laptops with internal 802.11ac Wi-Fi adapters shipping to date. Here’s what makes this new technology so fast: The 802.11ac standard uses the unlicensed 5GHz radio spectrum, which is considerably less crowded than the 2.4GHz spectrum, where devices ranging from cordless phones and baby monitors to microwave ovens can stomp all over your network. What’s more, the 5GHz spectrum provides many more available channels: 21 nonoverlapping channels in the United States versus only 11 in the 2.4GHz spectrum (and only 3 of those 11 channels don’t overlap). Operating in the 5GHz spectrum isn’t the only factor that makes the new 802.11ac standard so attractive. Networks based on this standard also carry more data, thanks to its more robust encoding scheme. An 802.11n network using a 20MHz-wide channel can transmit data at 75 mbps over a single spatial stream, 150 mbps over two spatial streams, or 225 mbps using three spatial streams. An 802.11n network using a 40MHz-wide channel can double those numbers. But an 802.11ac network using an 80MHz-wide channel can deliver even higher throughput: 433 mbps over a single spatial stream, 867 mbps over two, and a staggering 1.3 gbps over three spatial streams. 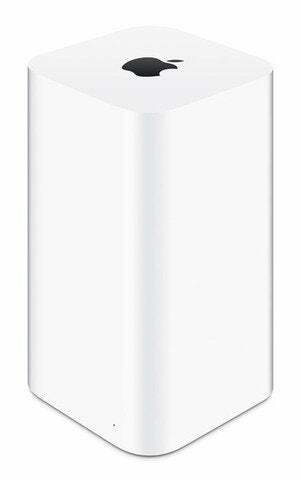 To aid networking efficiency, Apple’s new AirPort Extreme and AirPort Time Capsule also use beamforming antenna arrays. Beamforming is an optional element of the 802.11ac standard. Previous 802.11n models broadcast their signals in an omnidirectional fashion—in concentric rings, like the ripples that a stone tossed into a pond creates. A beamforming router actively exchanges information with its clients to determine the optimal path for signals to travel. The AirPort Extreme features simultaneous dual-band 802.11ac Wi‑Fi, transmitting at both the 2.4GHz and 5GHz frequencies at the same time. Regardless of which band your wireless devices use, they will automatically connect to the faster available band. The biggest drawback of the 5GHz spectrum is its shorter range (the higher a signal’s frequency, the shorter its range). On the other hand, since the 802.11ac standard packs so much data into its signal, the 802.11ac routers that PCWorld has tested have shown themselves capable of delivering more than twice as much throughput as 802.11n routers operating on the 2.4GHz frequency band. While the IEEE is unlikely to ratify the final 802.11ac standard until early next year, routers and Wi-Fi adapters based on the draft version of the standard have been on the market since last summer. So even if you prefer not to buy a new AirPort Base Station or Time Capsule, no problem. Just about every manufacturer in the wireless networking market—including Asus, Belkin, Buffalo, D-Link, Netgear, Trendnet, and Western Digital—is shipping an 802.11ac router, bridge, and/or USB adapter. You just need to find a Mac-compatible model to work with your new MacBook Air.